Moongil Dosa, a very flavorful and tasty dosa made from the Bamboo rice. Few months back, when my parents and my brother's family went to kodaikanal, Amma bought this moongil rice from there after heard all the benefits from the locals. 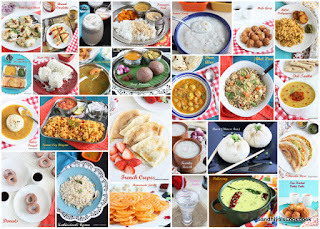 Later she asked me(i feel really very proud whenever amma ask me for the recipe :-)) for the recipe using moongil rice, honestly that was the first time i heard about that rice, so quickly did search on google and told her that kanchi(porridge), payasam(kheer) and dosai can be made from moongil rice. As a starter, she had tried kanchi and it didn't turned out as expected. She said it was really chewy and took forever to cook. So she kept that aside for a while without touching. Now when i'm here, she tried this dosa with equal proportion of idli rice and this moongil with very less expectations, but to our surprise it turned out super delicious, everyone in our family liked it so much. Wash and soak the moongil rice for 4-6 hrs. Wash and soak the idli rice,urad dal and fenugreek seed for 2 hrs. In a wet grinder, first put the moongil rice and grind it for 10 mins, then add the soaked idli rice, urad dal and fenugreek seed, grind it till smooth. Transfer the batter from wet grinder into vessel and then add the required salt and let if ferment for 4-6 hrs. After fermentation, take the needed amount of batter, if needed add water and making it as pourable consistency. Heat the dosa pan, pour the batter and make the dosa,drizzle the oil on the sides. After around 2 mins, flip the dosas and cook it on other sides also. Tasty Moongil dosa is ready to serve. Serve it with chutney or/and sambar. Bamboo rice takes longer time to soak. Bamboo rice has given wonderful flavor to the dosa. Instead of flavorless oil, use sesame oil for making this dosa to enhance the flavor more. Maravalli Kizhagu, a delicious and healthy snack prepared from tapioca root. In tamilnadu, it's known by various name like kuchi kizhangu & mara seeni kizhangu. In our area, we used to call them as "Elurai kizhangu" in local slang and i was sure that it wasn't the correct name, so today morning, i had searched the other names of tapioca stems in tamil, then only i got to known that one of the name of tapioca root is "Ezhilai Kizhangu (எழிலைக் கிழங்கு)". Guess that slowly transformed into Elurai Kizhangu in local slang. Interesting,Right?? Ok, now coming to the recipe, amma used to make this as evening snack or as sides for morning breakfast when tapioca stem is in season. It's such a simple, tasty and healthy dish to make in no time. Now let's check out the recipe. First peel the skin of maravalli kizhangu and then chop them into small chunks. Put them into water and wash it twice or thrice until the water becomes clear without any starch. Next keep the pan of water on the stove to boil. Once it comes to boil, add the kizhangu ,spices(turmeric & red chili powder) & salt. Cook them until it becomes soft & fork tender. Drain the water and keep it aside . Heat the kadai with coconut oil, add mustard and urad dal, let them splutter and then add curry leaves. Next add the cooked kizhangu and grated coconut, mix it well and let them in flame for 2 more minutes and switch off the stove. Delicious and healthy Maravalli Kizhangu is ready to serve. In this recipe, i have cooked them in open pot still i want them soft yet retain its shape. But you can cook them in pressure cooker also, may be just one whistle is enough. If i cook them in pressure cooker, will update here. Depends on the quality of the kizhangu, it takes more or less time of cooking. Coconut oil gives such a wonderful aroma to this. Samba Arisi Puttu is a delicious steamed cake from the samba rice flour and coconut. Samba rice is a variety of rice grown mainly in south India, it has reddish color and distinct taste & aroma compared to regular white rice and also it's believed to be more healthier than the normal rice.This samba rice puttu is my personal favorite puttu among all the puttu(rice puttu, rava puttu, ragi puttu) we make at home. Samba rice has that unique color and flavor, that makes the puttu more delicious and flavorful.So if you haven't tried this puttu before, do give it a try, i'm sure that you would love this unique taste and aroma. Still we're in the process of transition into new place, so for the past few months, we have been traveling continuously and i hardly find time to cook anything. Mostly we're having the food prepared by family members and i'm quite enjoying this no cooking & cleaning time. Even if i cook at my mil's or mom's place, it's difficult to shoot food photos since usually i take lot of time to shoot the final phots and that's not possible when every one waits for me to have food. But today morning, somehow i had prepared everything earlier for this puttu and took the photos as quick as possible since it's been really long time since i have posted a recipe here and now tada, here i'm with the post. Sugar,ghee & banana - as needed for serving. Take the samba rice flour, measure and put it in a bowl, add the salt. Mix it all well together, then add coconut water little by little and mix it well with the flour. The flour should be hold the shape when you press it with your fist and again it should be crumble when you crumble it with your fingers . That's the right way to check the consistency of the flour. And also make sure that there is no lump in the flour. Now take the Puttu Kuzhal(Puttu maker). Add the small plate with hole(it comes with puttu maker itself) in to it. First start off with the 1 or 2 tbsp of grated coconut. Next add the flour for about 1&1/2 inch thickness.Repeat the process and finish off with grated coconut on the top. Cover the puttu maker with the lid. Place the puttu maker in the cooker instead of weight and steam it for 5- 7 mins. Tasty Samba Rice Puttu is ready. Drizzle some ghee on top and serve it with sugar and banana. I have used coconut water from one coconut and for the remaining i have used regular water. Depends on your preference, you can more or less of grated coconut. To get the perfectly shaped puttu, the amount of water used is very important. For me it takes around 1/4 cup of 1/2 cup of flour. If the amount of water is less, then the puttu will not hold the shape and also it's very dry. Remove the lumps , while mixing the flour. Once you washed the puttu maker, wipe the inside of the puttu maker with tissue paper/kitchen towel, before adding flour. It helps to avoid the flour sticks to the maker, so that you will get perfectly shaped puttu. Once you mix the flour with water, immediately steam it, if you make large quantity, do it in batch. It will avoid the flour to become dry. If you dont have puttu maker, steam it in idly pot. I used store bought flour, if you are using fresh home made flour,it doesn't require this much water. Sugarcane Juice/Karumbu Saru , a freshly squeezed juice from the sugarcane. Sugarcane is one of the must ingredient we used to offer on Pongal festival. During pongal, the fresh sugarcane is available throughout Tamilnadu, India and i love to have them as it is and also throughout the year, the sugarcane juice is easily available from road side vendors in Tamilnadu. Also seen elder people(who can't bite the sugarcane) at my home town bring the sugar cane to the near by sugar cane juice vendor to squeeze the juice at nominal rate. So never thought of making juice from it at home. Now coming to making juice at home, last year, i had seen recipes from fellow bloggers making sugar cane juice at their home using mixie, since then i wanna give this method a try and for this pongal luckily we're in India, so just for the sake of making juice, i reserved few sugarcanes otherwise i would have finished them earlier. Making juice at home was way easier than i had expected, if you have good heavy duty indian mixie, then you can make them in secs. Now let's check how i squeezed the juice from sugarcane. First cut the sugarcane into slits using aruval or sharp butcher knife. Then it will be easy to break into pieces. While breaking them into pieces, the dark skin will be peeled off, discard them and use only the sugarcane flesh. Do the same for the whole sugarcane. Peel the skin of ginger and add it into the mixie jar, then add the sugarcane. Grind them into paste and then strain the juice using the strainer, discard the residue. Then squeeze the lemon into it and mix well. Pour into the serving glass. Homemade Sugarcane Juice is ready to serve. If you want them to serve chill, refrigerate few hours before serving, don't add ice cubes, it will dilute the juice. Heavy duty Indian mixie required for making this juice. Ginger and lemon juice is purely optional, but adding them enhancing the taste, so highly recommend it. Nellikai Thuvaiyal, a healthy and tasty thuvaiyal made from gooseberries. Today's recipe is from my mom's place. Amma made this thuvaiyal for our lunch yesterday along with puli kuzhambu,katti paruppu & siru kizhangu thuvaram. All i did was clicked and had this yummy meal. Amma told me about this thuvaiyal a long time ago, since it's hard to find fresh gooseberry in US, i haven't tried on my own so far. So this is the first time i had this thuvaiyal and really liked it a lot. Best accompaniment for curd rice for sure !!! If you're looking for some healthy & tasty thuvaiyal, do give this a try, i'm sure that you won't be disappointed. Wash the gooseberry and put it in the pressure cooker along with little water. Cook it for one whistle, let the pressure released by itself and then open the cooker, cut the gooseberry into four and remove the seed. Next heat a kadai with 1 tsp of oil and add the urad dal. Let the urad dal roast for one min, then add the red chili, tamarind, curry leaves,salt one by one and roast it till nice aroma comes from it. Then add the coconut and garlic, let them also roast till they are aromatic. Remove from flame and let it cool completely. First put the roasted ingredients into the mixie jar and grind into coarse paste, then add nellikai, if needed add water and grind into smooth paste. Heat the kadai with remaining oil, add the grounded thuvaiyal and saute it till it becomes non-sticky. That's it, Tasty and Healthy Nellikai Thuvaiyal is ready. Depends on the tanginess of the nellikai, add more or less of tamarind. Here i have used skinned & slitted urad dal for best flavor. But you can use whatever you have. Sesame oil gives great flavor to the thuvaiyal. Double Layer Coconut Burfi, a delicious and easy to make burfi with coconut. I have a vivid memory of eating coconut burfi from the petti kadai(small shop) during my school days. In those days, these coconut burfi and pori vilangai were my favorite after lunch snacks and those were 50 paise/ piece then. In petti kadai, the coconut burfis were in two colors (white & pink) and i have a long term wish to make them at home. Instead of making them in two colors separately, i thought of making them in layers, but i'm not sure about the flavors goes into that petti kadai coconut burfis, i remember only the colors not the flavors , it's really long time since i had. So i went with my favorite flavors, cardamom for white layer and rose essence for pink layer and also i have added a small amount of milk powder(i'm sure that this was not included in the petti kadai burfi recipe) for extra richness and taste. To my surprise, it turned out so soft and delicious. Before check out the recipe, here is a quick update, we're moving to the new place again, those who know me personally would have know that how many times we have moved since we got married, sometimes, it's kinda feel like a modern nomadic life. As much as we like to move to new place, at times, it's kind of tiresome to start from scratch again & again. Is anyone relate to it ??? So, coming to the point, since we're moving, there will a lack of post for a while until it got my own kitchen again. Meantime, enjoy your time here. Merry Christmas and Happy New Year to all. First let's make the cardamom layer, take the sugar in a pan, add water just enough to cover the sugar and let it melt completely. Let it boil until the sugar syrup reach one string consistency, then add the coconut flakes and milk powder. Mix it well without any lumps and then add the crushed cardamom. Cook till the coconut mixture leaves the sides of the pan and then transfer the mixture into the ghee greased/ lined tray and flat the top with the ghee greased spoon/spatula. Next let's make the rose layer, take the sugar in a pan, add water just enough to cover the sugar and let it melt completely. Let it boil until the sugar syrup reach one string consistency, then add the coconut flakes and milk powder. Mix it well without any lumps. Then add the rose essence and food color into it and mix it well. Transfer the mixture on top of the cardamom layer and smooth out the surface on the top. Let it cool a bit and cut into squares. Let it cool it completely and store it in air tight container. Delicious Coconut Burfi is ready. Instead of doing it in batches, you can make it in one shot and in the end divide the mixture into half and add the different flavoring into each one. If you're doing like me, make each layer separately, then you have to super quick in making the second layer before the first one sets. Other wise the layers cannot stick together. While making the second layer, keep the first layer near the stove itself, that way it won't set immediately. Milk powder gives richness to the burfi. You can add upto 1/3 cup of milk powder for this burfi. I have pulsed the coconut once in a mixie for fine texture. But it's optional.